While your little one may too young for candy and treats this Valentine’s Day you can still spoil her rotten (or sweetly as the case may be) with her very own freshly baked Organic Cupcake Onesies from The Baby Bunch. Each reusable magnetic clasp dotted Kraft paper bakery box of luscious cupcakes is packed with unbleached, super-soft 100% organic cotton onesies. Each of the onesies is “topped” with a decorative element such as a removable fruit or flower. Onesies are left undyed, so their natural color is just right for baby boys or girls — and they are generously sized for infants 0-6 months or up to 16 lbs. The best part — while perfectly cavity free, these cupcakes are still sugary sweet enough to make new parents swoon. While your little one may too young for candy and treats this Valentine's Day you can still spoil her rotten (or sweetly as the case may be) with her very own freshly baked Organic Cupcake Onesies from�The Baby Bunch. 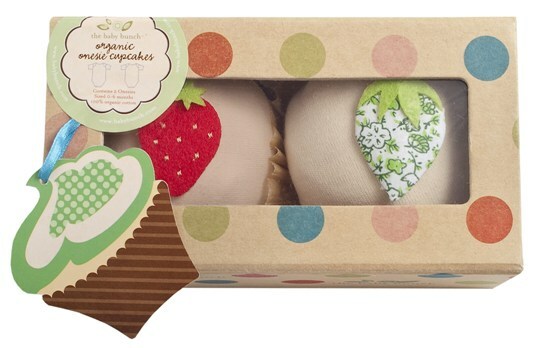 Each reusable magnetic clasp dotted Kraft paper bakery box of luscious cupcakes is packed with unbleached, super-soft 100% organic cotton onesies. Each of the onesies is �topped� with a decorative element such as a removable fruit or flower. Onesies are left undyed, so their natural color is just right for baby boys or girls -- and they are generously sized for infants 0-6 months or up to 16 lbs. The best part -- while perfectly cavity free, these cupcakes are still sugary sweet enough to make new parents swoon.